Which skill that you’ve learned performing music, helps you in everyday live? In for the adventure of performing and creating music as an ensemble since September 2017, we have learned a lot. We first started working on a program with existing new music repertoire of Eric Wubbels, Fausto Romitelli and Alexander Schubert. These pieces have challenged us to play together with the joint energy of a rock band. This energy is found not only trough rehearsing scores, but also by means of movement exercises, sharing notes and many talks… In order to be considerate and critical for each other, in order to solve problems together, honest and –to this point communication is crucial – in rehearsals and in many other aspects of life. Making chaos a little bit less chaotic. Context is text, or in our case: music. From the start, one of our goals is to create performances where the audience becomes part of a process, an immersive experience. For us, art means bringing people together in a context outside the rush of everyday life. So, we conceive of our concerts as “intensified contexts” for our audience to fully engage in the material moment of the now. 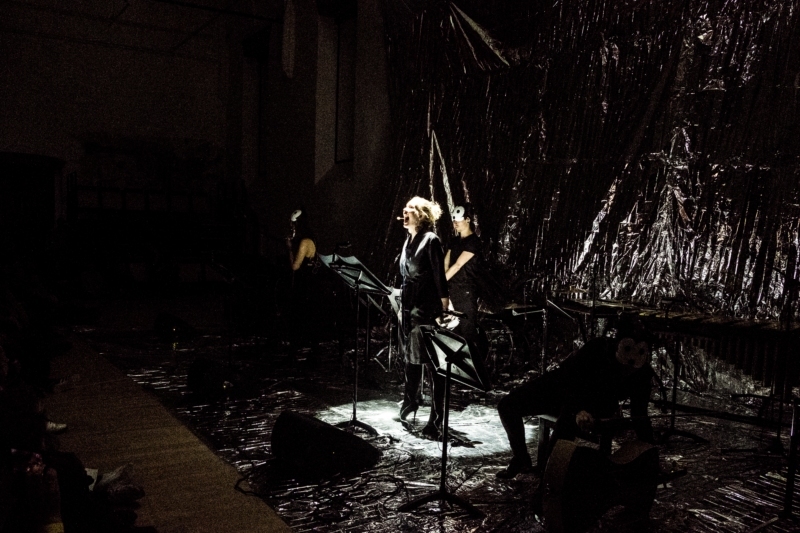 Therefore, Nemø ensemble not only act as a performer, but also as a curator that frames music, along with light, space, movement… into an overarching performance. Context in its narrower meaning, being the site of the performance, evidently plays a major role then. Its spatial, acoustic and aesthetic qualities determine to a large extent the “intensified contexts” we create. In the projects we’ve done so far, we’ve mostly been focusing on how we can control those qualities. Together with visual and performance artists, we searched for small “scenogaphic gestures” to make a performance site our own. Now, with the experience we’ve gained and the thoughts of many artists we’ve met, we are more attracted to work the other way around and let the performance context influence us. So, in upcoming projects we will search for performance sites and specific collaborative, hands on processes of creation that allow for this dynamic.